The Sheep Station Gully Flood Study was a classic open channel flood study undertaken in the Brisbane local government area. 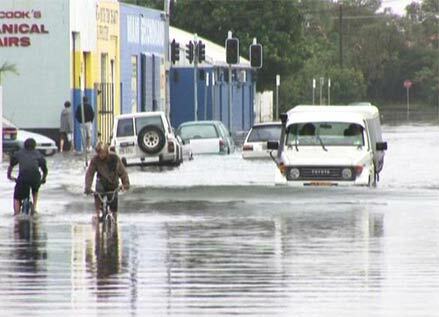 Full reporting was completed as well as flood map production. 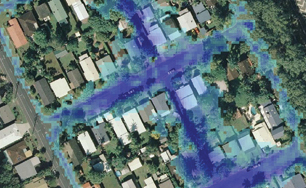 The report was adopted by Brisbane City Council for flood management purposes and the provision of hazard information to residents. The hydrological package used was Rafts, simulating calibration events, design storms (2-yr to 100-yr ARI), and rare and extreme floods (500 – yr, 2000 – yr and Probable Maximum Flood). Two hydraulic software systems were employed, TUFLOW for flood routing, and HECRAS to validate energy losses across bridges and culverts. The WaterRide software was used to add freeboard to flood surfaces, then to project these new surfaces outwards to form a new flood extent. This study was completed by a sub-contracting arrangement to Council’s City Projects Office. The Pimpama Village is a 53 hectare 389 lot development adjacent to Hotham Creek in the City of Gold Coast. 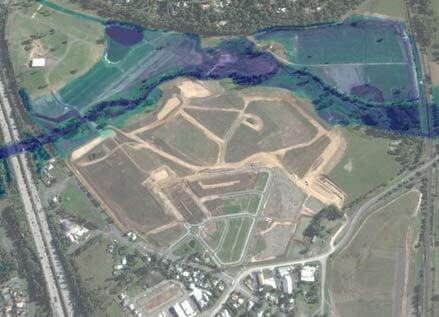 The site is located on the floodplain between the M1(left) and QLD Rail (right), is flat in grade and therefore sensitive to floodplain modifications. The site is also within Council’s ‘designated flood extent’, triggering conditions for compensatory cut and fill storage, and ‘no worsening’ of flood levels to adjacent property. By approaching the development from a first principals understanding of hydraulics, modifications were made downstream of the M1bridge to streamline flow patterns and decrease energy losses, leading to an overall reduction in flood levels at adjacent properties. These modifications doubled as sedimentation ponds during construction, and stormwater treatment (WSUD) post – construction. This project work was carried out under a sub – consulting agreement to Sedgman Pty Ltd (formerly Yeats Consulting) for Leda Property Developments. The previous Guanaba Road (lower alignment in adjacent image) traversed the Coomera River at the level of the floodplain and experienced frequent inundation. As the old bridge crossing approached the end of its design life, the road was ealigned to an elevated floodplain terrace. Hydraulic investigations for the design were complex. 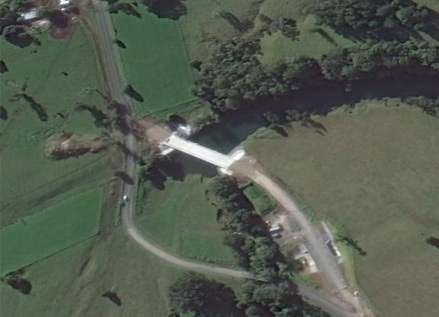 Floodwaters above a 10 – yr ARI event engaged a secondary overflow across the terrace, which was accommodated in the new road design by a large sub – surface culvert, doubling as an integrated livestock crossing. 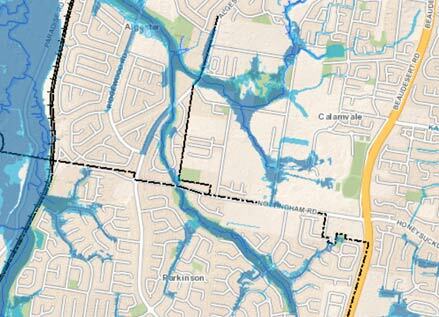 A regional 2D model tested ‘no – worsening’ of flood levels to adjacent land owners, and the required level of flood immunity for the new road. A fine scale 2D model tested various abutment geometries for scour protection design, and velocity fields during rare overflows for road pavement design. This study was completed by a sub-contracting arrangement to Gold Coast Council’s Technical Services Branch (now City Design). HYDRALINC has undertaken a number of urban stormwater flood studies since beginning in August 2012, for several local government authorities and also for a number of consultancies. Models have typically comprised a piped network coupled to a 2 – dimensional fine scale model, covering catchment sizes from 1 to 10 sq.km. 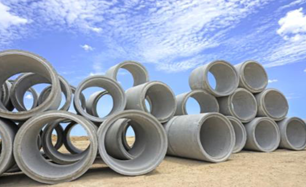 Stormwater investigations incorporated numerical modelling, ground truthing, survey specification, conceptualisation and development of stormwater upgrades, cost estimation, and benefit cost analysis. Projects have ranged from catchment – wide risk assessments, engineering feasibility and concept design, through to detailed design. The main outcomes of the stormwater investigations provided: mitigation projects for capital works programs; and, flood hazard information for urban flood management.